Bernd Beckert, Petra Schaper-Rinkel, Ulrich Schmoch und Dana Wasserbacher 2018. Visionary and collaborative research in Europe. Pathways to impact of use-inspired basic research. Breakthrough research with high impacts increasingly relies on collaborative, interdisciplinary and application-oriented contexts. The Future Emerging Technologies (FET) programme of the European Commission provides the funding environment for this new mode of research. The FET programme supports “use-inspired basic research”, which is curiosity-driven with a potential application in mind. In this report, we analyse the impacts of the FET programme using bibliometrics, an online-survey and case studies. We found that FET research has relevant impacts on the areas of knowledge production, the economy, people and society. FET research has strong impacts on knowledge production and triggers reverberations in many different disciplines. Researchers involved in FET projects are very active in publishing their results in scientific journals. Their publications are of high quality and outstanding relevance as demonstrated by the large number of publications in high-profile journals like science or nature. Other researchers frequently cite FET research results. The average citation rate of FET publications is higher than the citation rate of physics, which is used as a benchmark. The citation analysis also shows that FET results are cited in many different scientific fields: 36 percent of the FET projects in our sample have an impact on more than 20 scientific fields. This is a very high figure and reflects the interdisciplinary nature of FET. Novelty is another central feature of FET research. In the bibliometric analysis, we found that the overwhelming majority of FET projects (83 percent) deals with research ideas not present in the scientific community before and could therefore be termed “radically new”. The novelty aspect of FET and the attempt to try something that has not been done before is also very present in the perceptions of FET researchers. The survey showed that FET researchers believe the programme offers the opportunity to do research that goes beyond the mainstream. Interdisciplinarity in FET projects is characterised by a partnership of equals and is not dominated by any one discipline: We found a high level of interdisciplinarity in 68 percent of all projects. In addition, FET projects allow researchers to take their work in new directions: 31 percent of FET researchers in our survey said that FET allowed them to branch into a new area and try out exceptionally innovative, high-risk projects. FET projects have relevant impacts on the researchers involved. In our survey, 88 percent of participants said that FET had promoted their scientific career. FET projects triggered follow-up projects in 86 percent of cases and resulted in scientific awards in 29 percent of cases. These are impressive figures for high-risk research. The case studies revealed that researchers involved in FET projects develop a certain attitude towards scientific, economic or other impacts: They actively seek opportunities where their research can be used to solve problems even outside their own field. As such, the impacts of FET go beyond merely scientific or industrial impacts, because FET projects encourage a certain way of carrying out and applying research. FET projects have relevant impacts on the economy. The portfolio analysis revealed that 40 percent of projects had at least one partner from industry. Another good indicator of economic impact is the number of co-publications with industry: In our sample, at least one publication was written with the participation of an industrial partner in 32.6 percent of all projects. Again, this signals a high level of cooperation with industry. The number of patent applications also demonstrates the potential economic impact of FET projects. A quarter of the analysed FET projects reported at least one patent application based on FET results. 12 percent of FET projects led to the founding of a spin-off company. Again, a remarkably high figure when comparing this with experiences in academia and other public research funding programmes. FET researchers are very active in communicating their results to industry: 83 percent of the respondents to our survey said that they had contacts with industry in the context of their FET research. These contacts included presenting results at industry conferences or direct contacts with industry. FET projects have relevant impacts on society. As FET researchers still define themselves as being part of a technology development community rather than a community solving societal challenges, we did not expect a high awareness of societal impacts in our survey. However, contrary to our expectations, we found a relatively high share (17 percent) of researchers reporting societal impacts of their FET projects: Nine percent said that their research in FET contributed to tackling Europe’s grand challenges and eight percent reported “other societal impacts”. According to our survey, there are other societal impacts in the areas of technology assessment, mobility, healthcare, regulation, education, air quality and others. 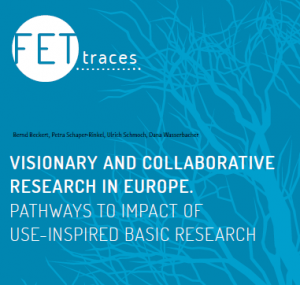 Supporting a specific mode of research that can be characterised as “use-inspired basic research”, the FET programme is a unique research funding programme within the European research funding landscape. Its uniqueness is due to its emphasis on novelty, interdisciplinarity and collaboration, as well as its specific focus on technology and application relevance. As such, the FET programme is an important part of the European research funding landscape. The results of this impact study suggest that FET research should be strengthened in the future as it has specific and highly relevant impacts in all four impact areas considered.